In the winter of 1271, Death stalks the corridors of Wynethorpe Castle on the Welsh border. When the Grim Reaper touches the beloved grandson of the castle lord, Baron Adam sends for his daughter, Prioress Eleanor of Tyndal, and her sub-infirmarian, Sister Anne, to save the child with prayers and healing talents. Escorting them to the remote fortress is Brother Thomas, an unwilling monk fighting his private demons. Death may be denied once in his quest for souls but never twice. Soon after the trio arrives, an important guest is murdered. The prioress's brother, bloody dagger in hand, stands over the corpse. All others may believe in his guilt, but Eleanor is convinced her brother is innocent. 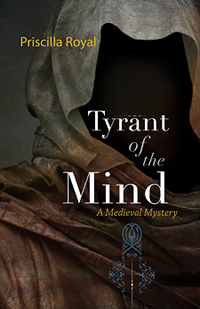 Outside her priory, in a world of armed men, Eleanor may have little authority, but she is determined to untangle the Gordian knot of thwarted passions and old resentments even if it means defying her father, a man with whom she longs to make peace. As passions rise with the winter wind and time runs short, Eleanor, Anne and Thomas struggle to find the real killer. "The author carefully renders the hardships of surviving the harsh winters without obscuring the small pleasures that people of the period enjoyed. Eleanor, forceful or diplomatic by turns, is an engaging and resourceful heroine, and Brother Thomas shows surprising depths and strengths. Royal brings her 13th-century world vividly and artfully to life in a series sure to have a bright future." "Royal combines an intriguing 'country house' mystery with a cast of engaging characters whose realistically complex motives and personal issues lend the story depth. With a deft and subtle flair rivaling that of Brother Cadfael, Prioress Eleanor sets her world to rights and leaves us wanting more."